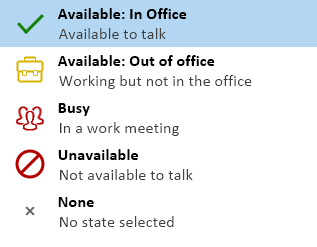 The tray menu is accessed by right-clicking on the Go Integrator Client icon which is a green square (or red if you're on a call or yellow if a call is on hold). Note: In Windows 7 and above, some tray icons become hidden and expressly have to be shown. These settings are stored in the "Notification Area Icons" part of the Windows Control Panel. At the bottom of the tray menu is a text box where users can enter text or numbers to search for in all of the integrated applications. Results are displayed directly in the tray menu as text is typed into the text box. 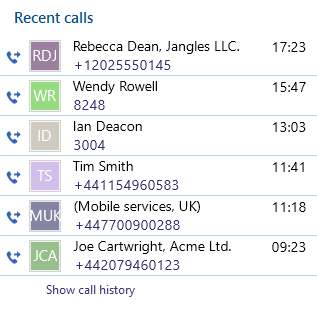 Calls can be made to any contacts that are found by clicking on the number displayed in the results. 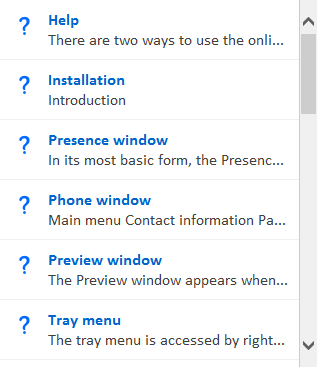 Clicking on the icons down the left-hand side of the tray menu displays the various sections of the tray menu. From this section, users can access the other parts of Go Integrator Client by clicking on the appropriate option. Click this option to open the software's online help in your default internet browser. Double-click on the option you would like to view. When this section of the menu is being viewed, the search text box is used to find words or phrases within the online help. Quickly see recently dialed numbers, and click to redial them. The CommPilot* option allows to quickly select your preferred CommPilot Express profile. * The CommPilot state will only change for users subscribing to CommPilot Express. The Features menu provides you with options to control the behaviour of your phone. 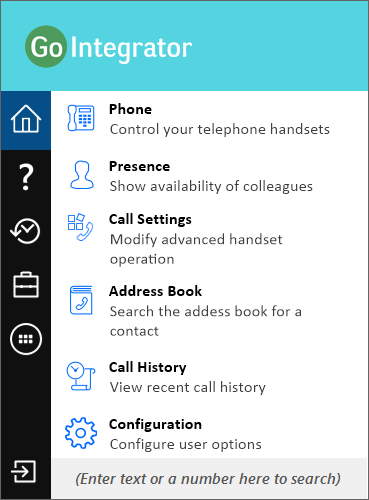 The options available from this menu are "Call settings", "Set Forward All" and "Set Do Not Disturb". Use this to unload the software.